200-gram gatefold LP plated and pressed at Quality Record Pressings! Analogue Productions has brought back Julie Is Her Name Volume 2, making it an undeniable classic in every sense of the word. Remastered by Kevin Gray at Cohearent Audio, and plated and pressed on 200-gram vinyl at Quality Record Pressings, the result is a memory-stirring masterpiece. Julie Is Her Name — Volume Two, has all the sincerity and warmth of her professional album debut, the best-selling Julie Is Her Name, from Liberty. An untested singer with uncompromising musical faith, an unknown record company, sophisticated, tastefully presented standards presented simply backed by just a bass and guitar — Julie Is Her Name faced long odds of success. Yet it soared to become a best-selling hit. 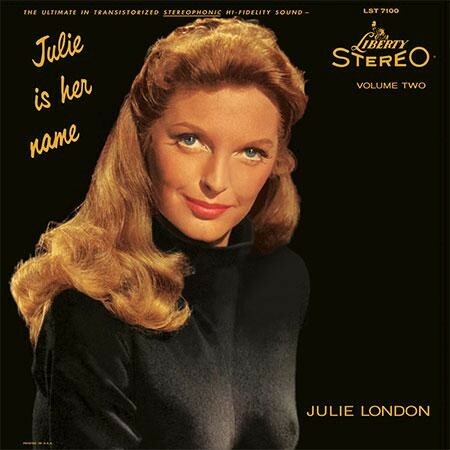 Julie London rose to the Top 10 of every list of female vocalists. And as to the cover, expect only top-notch reproduction for our Analogue Productions reissue. Originally a single LP jacket, we've upgraded to a gatefold incorporating more original photographs provided by Universal.